The DisplayCover keyboard concept could extend your Surface Pro's screen real estate with an e-ink touchscreen. Microsoft’s Surface Pro 3 has gone a long way to creating a tablet that can truly replace a laptop. Now that the core device itself is so darn slick, Microsoft’s Applied Sciences research and development team is getting funky, revealing a new mobile keyboard concept that adds more screen space to the Surface via a multi-touch e-ink display. Currently dubbed the DisplayCover, the new keyboard includes an e-ink display at the very top that displays menu options based on context. The basic idea is for the e-ink display to extend the desktop space by removing the taskbar or menu items from the tablet’s smaller screen. The DisplayCover is only a concept for now, but the design appears to be quite far along. The keyboard in its current state features a thinfilm e-ink display with 1280-by-305 resolution. 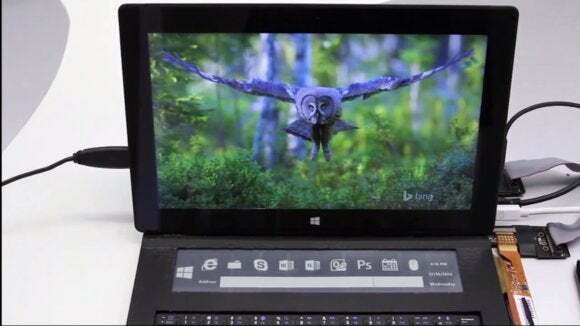 Microsoft says the smaller display can extend a Surface Pro 2’s primary screen real estate by up to 8 percent. Microsoft provided a demo video that shows the DisplayCover in action, and how it could work in real world scenarios. From the Windows 10 desktop, for example, DisplayCover could include the Start button and quick access to programs such as Skype and Word, as well as a toggle for launching Store apps from live tiles. Switch to a program such as PhotoShop and the e-ink display offers popular editing options, such as the magic lasso and smudge tools. Other ideas Microsoft is playing with include the ability to accept pen input, a fully working email client that exists only in the e-ink display, and the ability to browse photo thumbnails from the DisplayCover. The story behind the story: Microsoft is famous for concepts that never go anywhere. In fact, this isn’t the first time we’ve seen a keyboard concept/prototype from Microsoft. In 2010, Microsoft experimented with its Adaptive Keyboard that put an LCD touch display at the top of the keyboard. The screen also extended underneath the physical keyboard and included programmable display key tops, allowing users to change the keyboard layout based on context. Although a neat idea, the Adaptive Keyboard never became a commercial product. DisplayCover may have a better chance at hitting store shelves than its predecessor since it would likely be cheaper to produce. Plus, it has the added bonus of enhancing the functionality of the Surface in a pretty obvious way—assuming, that is, that people don’t mind switching between looking at a tablet display angled in front of them and then down to a smaller e-ink display at their fingertips.